Nothing brightens up January like a box of citrus waiting on your doorstep. My in-laws send us a gigantic box of Ruby Red grapefruit and oranges every year and it is always a welcome treat. The oranges quickly get eaten as snacks (although this year I plan to make a marmalade out of many them) and we serve the grapefruit with a dusting of sugar and a strong cup of coffee as breakfast. This year, to make our grapefruit breakfasts last just a tad longer, I decided to make curd out of the grapefruit to use as a spread on toasts and biscuits. Curd is a terrible word to describe something that has such a silky texture and balances sweetness and acidity with such finesse. I urge you not to get hung up on the name, before actually giving it a try. 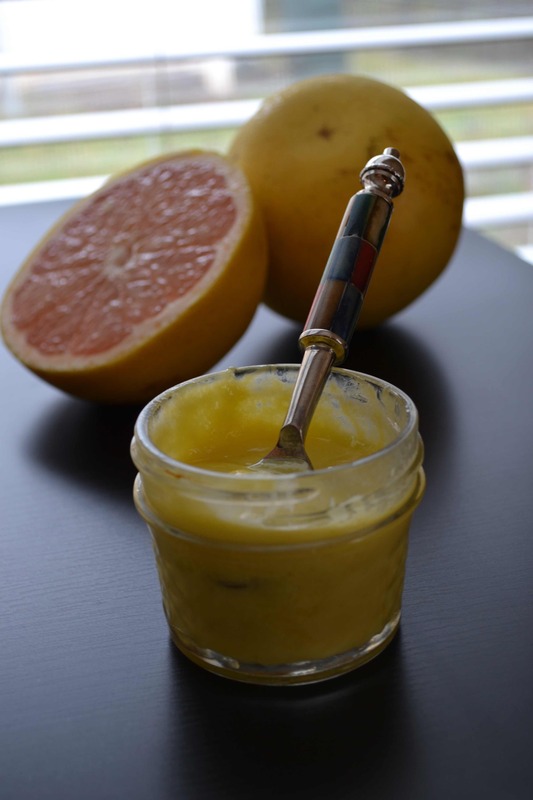 Curd can be made with any citrus including lemons, limes, and oranges and lasts for about 2 weeks in the refrigerator. There are many ways to make curd some of which involve double boilers, cornstarch, and carefully tempered eggs, but David Lebovitz’ self-described “dare-devil” approach was right up my alley. Egg cookery always makes me sweat a little and I welcomed the opportunity to dive right in, burners blazing with this curd. Despite my ramped up approach, this recipe does require you to keep the faith as the curd passes through several phases that can shake even the most confident among us the first time around. See it through, however, and you achieve a spread that amply rewards with every dollop mixed into whipped cream, each heaping tablespoon slathered on warm toast, and each spoonful eaten directly from the jar. Happy cooking! Curd will keep in the refrigerator for up to 2 weeks and can be used as a topping for shortbread cookies, a spread on toast (a friend of mine likes to serve lemon curd to her boys atop fresh ricotta on toast – it’s a delicious treat), and stirred into whipped cream for a decadent dessert among other things. I also like to eat it straight from the jar. 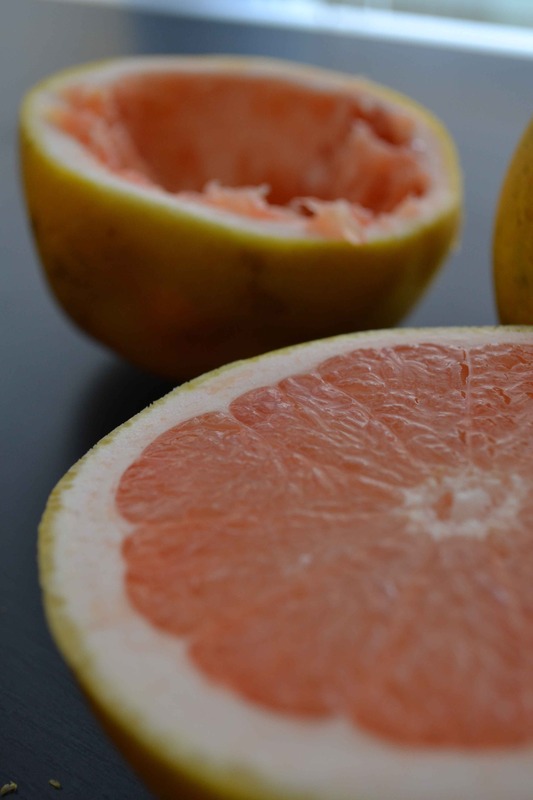 In a small saucepan, whisk together the grapefruit juice and sugar until the sugar dissolves. Whisk in the eggs, egg yolks, and salt until combined. Heat over low heat and add in the butter while whisking constantly. Heat the mixture, continuing to whisk constantly, until the butter has completely melted. The whisking will cause the un-melted butter to form little specks atop the mixture that appear to be curdled egg white. Don’t panic; continue whisking and they’ll eventually melt and go away allowing you to breathe easy again. Once the butter has completely melted, take a deep breath and increase the heat to medium. Continue to whisk until the mixture begins to thicken. I like to switch to a rubber spatula here as it allows me to scrape the mixture out of the corners where it tends to get stuck and overcook. Continue to cook, stirring constantly, until the mixture becomes jelly-like and can hold its shape when you pull the spatula through it. You might notice little specks of cooked egg, but this is not cause for panic as these unattractive bits will be caught in the final straining. When the mixture has thickened, immediately strain it through a fine mesh strainer into a clean bowl. Scrape the mixture into a storage jar and cool in the refrigerator for at least 2 hours before using. Curd will keep in the refrigerator for up to 2 weeks. What a delicious recipe- great idea! I will have to try this! Please do and let me know how it turns out. Happy cooking! 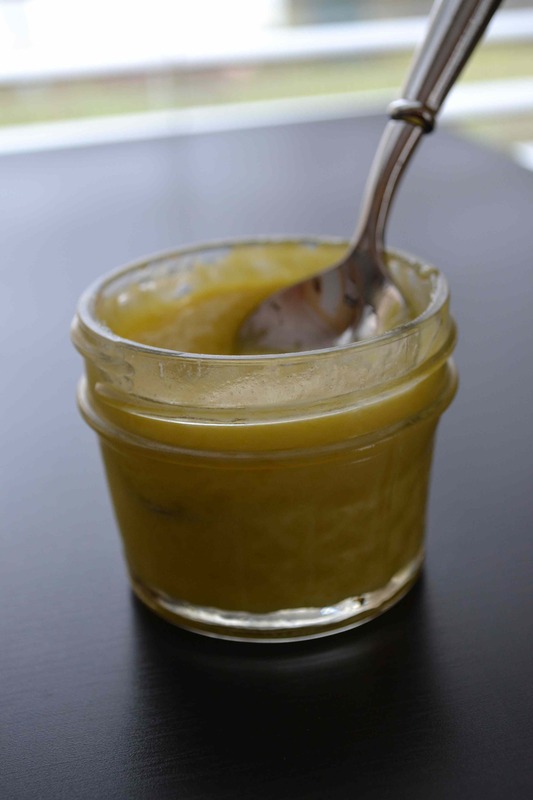 I love love love lemon curd. So excited to try this! Me too! If you give the recipe a try, let me know your thoughts. It sounds like you might be an expert on the subject. Thanks for reading.